This article is about the men's team. For the women's team, see Senegal women's national football team. Established in the early 1960s, the team have been regular competitors in the Africa Cup of Nations, where their best performance was runner-up to Cameroon in the 2002 edition in Mali. In the same year, Senegal took part at the FIFA World Cup for the first time and reached the quarter-finals, having defeated reigning champions France in the opening game. The team made their second World Cup appearance 16 years later, earning four points, being eliminated in the group stage against Japan based on fair play points. Senegal gained its independence from France on 4 April 1960, and the Senegalese Football Federation (FSF) was founded that year. The first Senegal match took place on 31 December 1961 against Dahomey (current Benin). Senegal lost 3–2. The Senegalese Football Federation (FSF) has been affiliated with FIFA since 1962 and has been a member of the Confederation of African Football since 1963. Senegal's first appearance in the Africa Cup of Nations was in 1965, where they finished second in their group, and lost 1–0 to Ivory Coast to finish in fourth place. In the 1990 Africa Cup of Nations, Senegal finished fourth. Senegal hosted the 1992 tournament. After finishing second in their group, they were eliminated by Cameroon in the quarterfinals. Senegal qualified for four of six African championships that decade. Senegal's best finish in the African Cup of Nations came in 2002, where they lost the final on a penalty shootout after drawing 0–0 with Cameroon. Later that year, Senegal made their first-ever world championship appearance at the World Cup. Senegal eventually reached the quarter-finals of the World Cup, one of only three African teams to do so (the first being Cameroon in 1990; the other being Ghana in 2010). In the group, after defeating defending world champions France, they drew with Denmark and Uruguay, and beat Sweden in extra time in the round of 16, before losing to Turkey in the quarter-finals. Senegal qualified for the 2008 Africa Cup of Nations, but finished third in their group with two points. They failed to make the 2010 FIFA World Cup in South Africa, the first World Cup to be held in Africa. After Senegal's former manager Bruno Metsu died on 14 October 2013, many Senegalese players were recalled to appear and have a moment of silence in memory of the manager who helped them reach the quarter-final in the 2002 World Cup. All activities of the national league and the national team were suspended for a few days in his memory. The West African nation narrowly missed the 2014 FIFA World Cup after losing in a round-robin match against Ivory Coast in the final qualification round. Senegal qualified for two Africa Cup of Nations tournaments since, being eliminated in the group stage in 2015 and reaching the quarterfinals in 2017. On 10 November 2017, after defeating South Africa 2–0, Senegal qualified for the 2018 FIFA World Cup, the second in its history after the 2002 World Cup in Japan and South Korea. Senegal defeated Poland 2–1 in their opening group match. The first goal was an own goal by Thiago Cionek, and the second one was scored by M'Baye Niang. In the next group stage match, Senegal drew 2–2 against Japan with one goal by Sadio Mané and the other by Moussa Wagué. However, despite having a great advantage, they missed the opportunity by losing 0–1 to Colombia, and due to poor fair play point comparing to Japan, who also lost 0–1 to Poland, Senegal was eliminated in the group stage for the first time in their World Cup history. The following players were selected for the 2019 Africa Cup of Nations Qualifier match against Madagascar and the friendly match against Mali on 23 and 26 March 2019. Caps and goals updated as of 26 March 2019 after the game against Mali. The following players have been called up for Senegal in the last 12 months. Players in bold text are still active with Senegal. ^ "BBC SPORT | CUP OF NATIONS | Cameroon retain Cup". BBC News. 10 February 2002. Retrieved 7 July 2012. ^ "BBC SPORT | WORLD CUP | Senegal | Senegal return to heroes' welcome". BBC News. 26 June 2002. Retrieved 7 July 2012. ^ "BBC SPORT | WORLD CUP | Senegal | Senegal press blasts Metsu". BBC News. 24 June 2002. Retrieved 7 July 2012. ^ Press Association (10 November 2017). "South Africa 0-2 Senegal: Diafra Sakho scores as visitors qualify for World Cup for just the second time". Daily Mail. Associated Newspapers Ltd. Retrieved 19 June 2018. ^ Tyers, Alan (19 June 2018). "Senegal World Cup 2018 squad list and team guide". The Daily Telegraph. Telegraph Media Group Limited. Retrieved 19 June 2018. ^ Shaban, Abdur Rahman Alfa (24 May 2018). "Road to Russia 2018: Senegal returns to World Cup after bright 2002 debut". Africa News. Retrieved 19 June 2018. ^ Kozminski, Piotr; Nzetia, Cynthia (19 June 2018). "Teranga Lions roar to first African win at Russia 2018". FIFA.com. Retrieved 20 June 2018. ^ Barclay, Tom (19 June 2018). "POLE AXED Poland 1 Senegal 2: Thiago Cionek own goal and M'Baye Niang strike sinks the hopeless Poles in Moscow". The Sun. Retrieved 20 June 2018. ^ "Niang scores controversial Senegal goal". BBC Sport. BBC. 19 June 2018. Retrieved 20 June 2018. ^ Sridhar, Shrivathsa (24 June 2018). Trevelyan, Mark; Lawson, Hugh (eds.). "Honda salvages 2-2 draw for Japan against Senegal with late strike". Reuters. Yekaterinburg. Retrieved 25 June 2018. ^ Petterson, Joel (27 June 2018). "Colombia Emerges From the World Cup Chaos, Booting Senegal". New York Times. The New York Times Company. Retrieved 28 June 2018. ^ Grez, Matias (28 June 2018). "Colombia and Japan qualify for last 16 as Senegal crashes out of World Cup on fair play rule". CNN Sports. CNN. Retrieved 28 June 2018. ^ "La FSF rompt officiellement avec Romai". galsenfoot.com (in French). Galsenfoot. 28 September 2017. Retrieved 29 September 2017. ^ "Sénégal – Matchs contre Madagascar et Mali : Voici la liste des 25 lions convoqués par Aliou Cissé" (in French). galsenfoot. ^ a b Mamrud, Roberto. 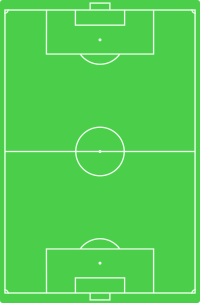 "Senegal – Record International Players". RSSSF. Retrieved 17 November 2018. Wikimedia Commons has media related to Senegal national football team. This page was last edited on 21 April 2019, at 03:27 (UTC).